Most of us know the tri-arrow symbol we associate with “recycling,” but the three arrows are actually meant to represent the concepts of “reduce, reuse, AND recycle.” So, the notion of pre-cycling captures the reduce and reuse steps of the cycle. Reducing the waste we create is something that takes some forethought. A lot of us assume that we can “just” recycle some goods, and our job is done. But recycling really does use a lot of energy in and of itself. In some cases, objects that are represented as recyclable are actually limited in their ability to be recycled. Many communities have limitations on what they can accept for recycling, especially in the way of plastics. Glass, aluminum, tin, and steel are considered to be the most readily recyclable. 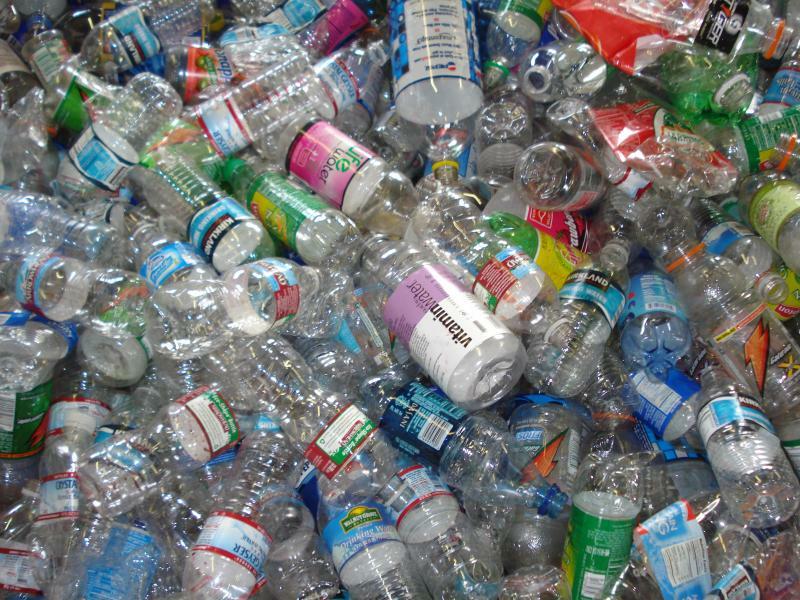 Glass bottles are the easiest to recycle because they can just be washed, refilled, and recapped. If you live in a place that continues a bottle deposit program, you know that you can get money back on glass bottles. Also, aluminum is another recyclable that pays per pound in most communities. So, I’m just going to come right out and say it. I hate Tetra-Paks, juice boxes, drink pouches, chip bags, and plastic bottles of WATER. The plastic water bottles are an easy fix–don’t buy them, find a water fountain, buy a portable water bottle of your choosing, or if you are desperate, go ahead and buy the water and refill it for free! It’s water, people. If you don’t like the way it tastes from your tap, buy a filter. Yes, filters are meant to be disposable, but they last for about 2-3 months and is tiny by comparison to the hundreds of bottles you’d buy for “good-tasting” water. And we all know that much of the bottled waters we have spent extra money to buy is another city’s tap water, right? It’s time to get over this mindset that bottled water is a good idea. It’s not. Tetra-Paks and juice boxes (often one in the same) are convenient storage containers for liquids and come in variations on the theme of cardboard on the outside, aluminum and plastic on the inside. The plastic is supposed to bpa-free, which is better for the foods contained inside (at least it makes them healthier to eat). They are also exceptional at storing milk and other “spoilable” liquids for a very long time. Better storage does mean less waste of the product itself, but these packages are very difficult to recycle. Some Tetra-Paks exclude aluminum, which makes them somewhat easier to recycle, but not many municipalities even accept Tetra-Paks (at least in the U.S.). It is the complexity of the multilayer packaging that makes it difficult to separate and repurpose. Your best bet, if possible, is to avoid buying products in these packages. What’s worse, perhaps than the the Tetra-Paks, is the “drink pouch.” Those infamous Capri Sun silver packets of usually 10% juice + water + sugar came into existence about 25 years ago. That makes 25 years of kid-licious drinks packaged in this (from Kraft’s FAQ page): “CAPRI SUN pouches are polyester-reverse side printed to aluminum then laminated to polyethylene (a plastic polymer). Unfortunately, this packaging is not recyclable.” If you have been to a kid’s birthday party or soccer game or during lunchtime at a school cafeteria, you know the popularity of these never-gonna-be-recycled packages of drinks. The best thing for this? Do not purchase them, unless you absolutely must. I don’t want to say an aluminum can of anything is better, but at least you can recycle cans. So, now that you are thinking about it, you are probably thinking about the packaging for granola bars, candy, chips, heck, even the plastic netting that a 3-pound bag of onions comes in…what do we do with it? Obviously, you can stop buying pre-packaged foods and non-essential packaging. It takes some training, but start a hoard of paper bags and use them for whatever…paper is much more easily recycled, but a good paper bag will last at least 10 uses. Those plastic netting bags can be wadded up and used as a kitchen sink scrub, or taken back to the grocery store to be used for your next batch of fresh fruits and vegetables. I’ve been using one to collect the fallen pecans around the neighborhood. It’s healthier to avoid complex packaging, especially when it comes to food. I know you want to still live a “regular” life, though, and the idea that you are going to make all of your own stuff from “scratch” to save on packaging is probably not realistic. With a little planning on the weekends, though, you can create some healthier snacks that can be taken to school or work in reusable containers (optionally wrapped in paper or aluminum foil), or stored at home in a cookie jar or other reusable container. I know it sounds daunting for some parents, but when you think about what all goes into the landfill from just your house, and multiply that by all of the people in your town, and multiply that by all of the towns in your state, country, continent…we are a wasteful bunch of slugs that need to reconsider what we are doing to the planet just for the sake of sugar, water, and snacks. I ran across this quote recently and I think it is something to consider: “The frog does not drink up the pond in which he lives.” ~ Native American Proverb, Sioux Sorry for being on the preachy side, but it’s time to consider the consequences of our actions. This is just one tiny aspect of the impact we have with our carelessness…think of what impact we can have if we try to change it for the better with intent!